Canadian label PRC Music is on a march this year. I reviewed Rise From Ruins by Wreckage back in February and while a lot of music is on the way from the label, I thought I check out Croatian death duo Hereza, whose debut album Misanthrope was released around the same time. Hereza is a another new band to me, having only formed in the middle of 2014. They've been super productive though with this fourteen track beast! One thing I’ve discovered over the years is that it really doesn’t matter how many bands members you have. You can have six, seven, or even eight if you want, but having fewer is better for the creative process in most cases. The Croatian duo of Hereza prove that with some incredibly tight and focused death metal. The title-track opens up with a nice nod to the old-school while Grob is chock full of thrash. The guitar teeters between melodic and buzzsaw, with plenty of punch. Hereza’s thrash influence spills over into Kraj, which sees the band going for it in both song-length and outright pace. Oh and there’s a small matter of that solo too! Unholy Flame Of Eternity starts with a raw black metal intro before punk overrules it. This urgent approach is infectious and is channels the speed-worship of Motorhead. 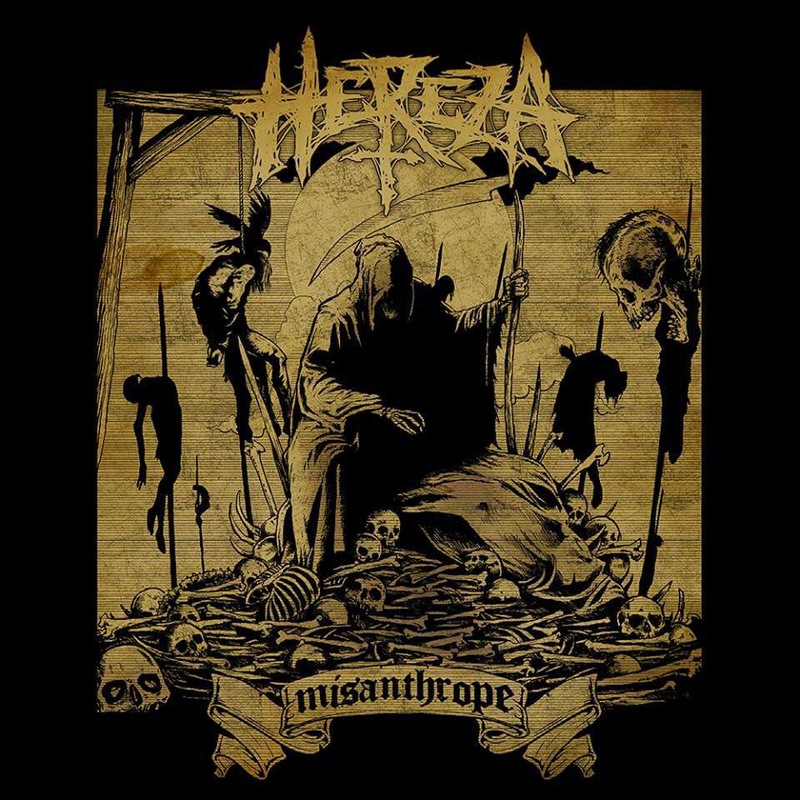 There are so many strands of death metal these days and it can be hard for bands to settle of a specific sound, so it’s great to hear that Hereza have chosen to play fast and have stuck with it throughout. We Are The Disease is frenzied and they only get faster from here on in. I thought that fourteen tracks was gonna be a bit much for those with ADD, but on hearing Objesen, that assumption is completely wrong. In true review fashion though, Hereza through in a curveball at the mid-way point. Whole World Burn is a dirge-laden crawl compared to Misanthrope’s earlier songs. Their mid-paced and off-kilter instrumentation changes the atmosphere of the record and takes it in a darker direction, even if it is only for one song. Normal (fast!) pace is resumed with Bullet Storm, which is an apt name for the song. It full-on rages from start to end and it complete with plenty of heavy metal goodness, including another top solo. That pesky Motorhead influence is back on Cancerous Demise, with some of the best riffs since Ace Of Spades! Pretty bold statement to make, but just listen for yourselves. Pills goes by super quickly, with no time for breath. Noc Zivih Mrtvaca is one of the only songs that Hereza sings in their native tongue and despite my lack of Croatian, it still sounds mighty. Even though Misanthrope is coming to a conclusion, things don’t slacken off. Death Army March feels more muscular than some of it’s predecessors, with some pretty hefty riffs amongst the death metal backbone. The sound levels during closing duo Erase The Disgrace and Mud is set to stun. For a duo, Hereza are not just musically sterling but also powerful. The production on Misanthrope brings out the best in them and judging by the standard of this debut record, they are only going to get bigger and better.